For all flock types and sizes. 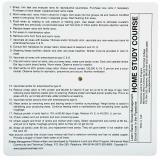 8" x 8" laminated plastic card. 5" diameter wheel. Takes the guesswork out of shepherding. Great handy chart for daughter planning her 4H lamb breeding cycle. This is just what I've been needing its gonna make things a lot easier knowing what and when to get important things done. 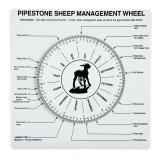 However I wish their was a wheel also for the ewes cycle. I would like to know when an ewes next two heat cycles are going to be when I catch her marked by a harnessed ram, mounted by a teaser or just standing as close as she can get to the ram pasture batting her eyes at em. It would help to be able to spin the wheel to an in date and have it tell you the next two cycle dates. Having to count that up by hand is not easy. It's not something I have to do but want to. Some young ewes are getting pushed aside by older larger ewes. To know cycle dates = re introduced to the ram on cycle dates with out having to leave the ram in that pasture. Instead I could take the ewe to the ram. Which I often do. This allows me to visit my ewes in safety and comfort not worrying about the ram and keeping an eye on him. It's just safer and easier once everyone is covered the first time. 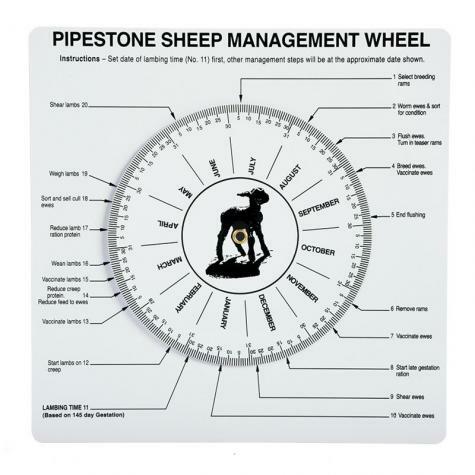 Fun Little Wheel that helps you plan out your year around when you want kids/lambs to hit the ground.